be well-written and super-extensible so that others can add their own functionality. Unfortunately, because of the tightly-coupled design and overall architecture, it’s difficult (if not impossible) to extend these parsers with custom logic. 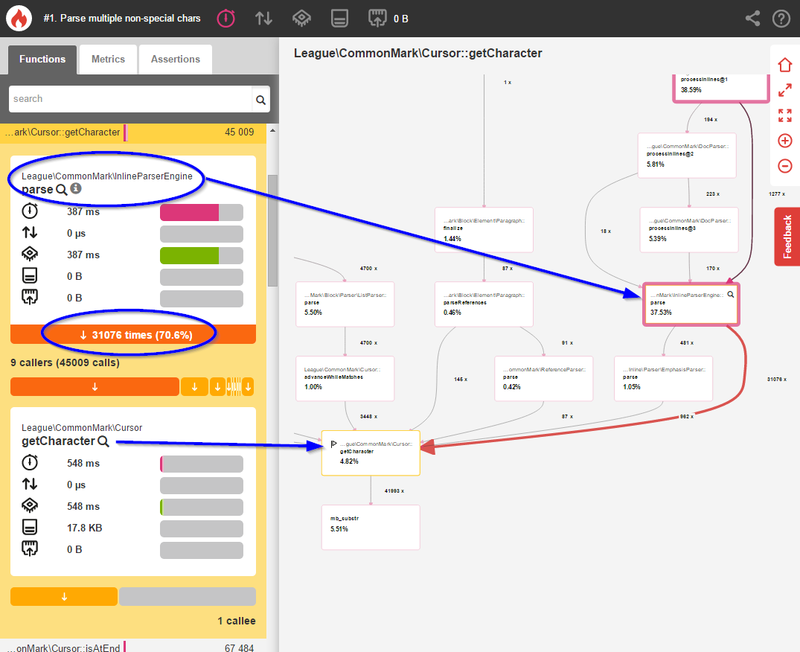 For the League’s CommonMark parser, we chose to prioritize extensibility over performance. This led to a decoupled object-oriented design which users can easily customize. This has enabled others to build their own integrations, extensions, and other custom projects. The library’s performance is still decent — the end user probably can’t differentiate between 42ms and 2ms (you should be caching your rendered Markdown anyway). Nevertheless, we still wanted to optimize our parser as much as possible without compromising our primary goals. 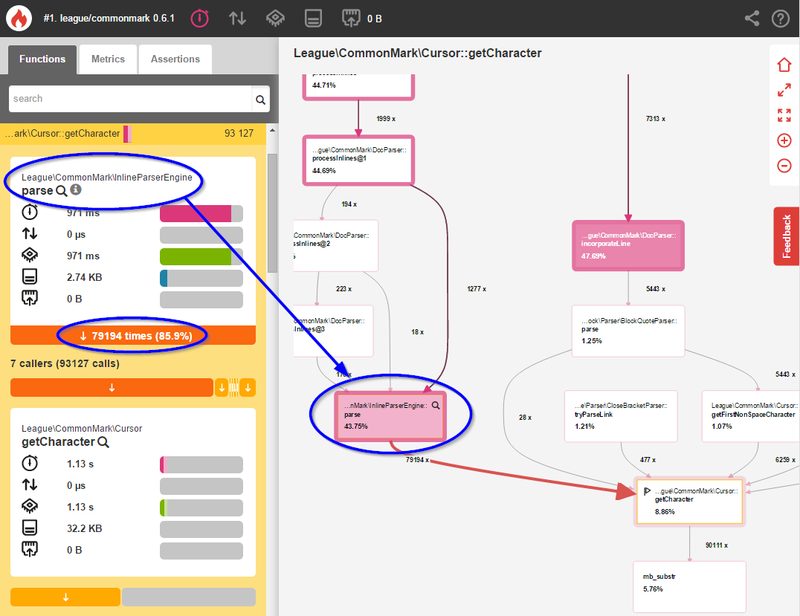 This blog post explains how we used Blackfire to do just that. 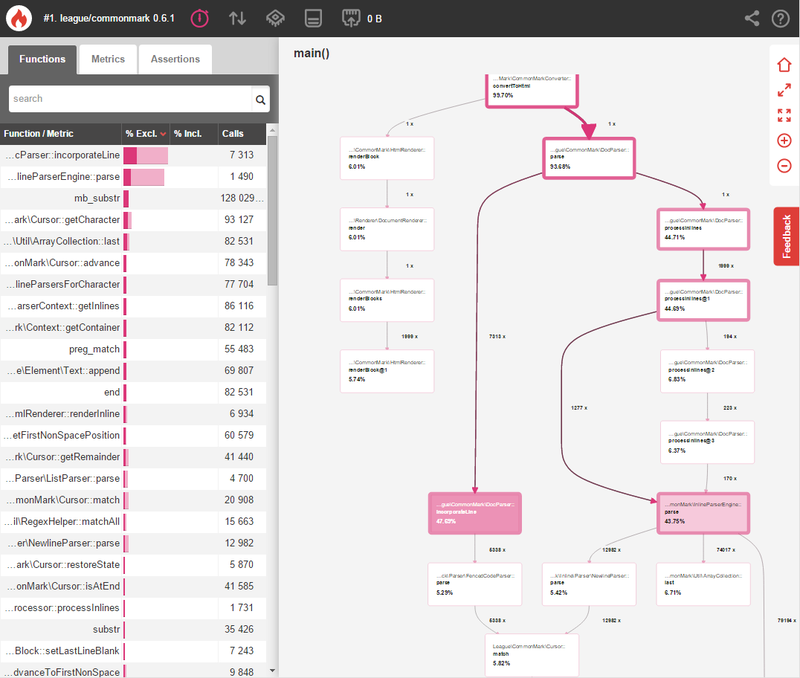 Blackfire is a fantastic tool from the folks at SensioLabs. You simply attach it to any web or CLI request and get this awesome, easy-to-digest performance trace of your application’s request. 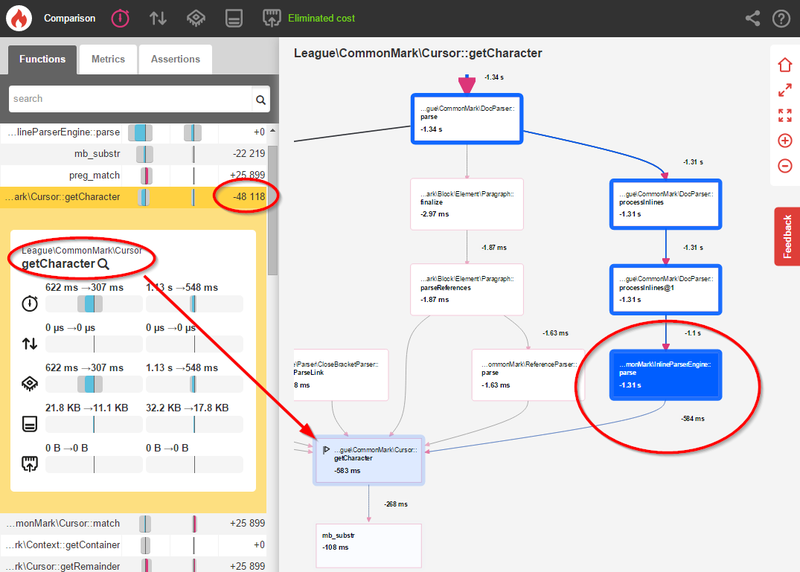 In this post, we’ll be examining how Blackfire was used to identify and optimize two performance issues found in version 0.6.1 of the league/commonmark library. Later on we’ll compare this benchmark to our changes in order to measure the performance improvements. Quick side-note: Blackfire adds overhead while profiling things, so the execution times will always be much higher than usual. Focus on the relative percentage changes instead of the absolute “wall clock” times. Blackfire tells us that parse() is spending over 17% of its time checking every. single. character. one. at. a. time. But most of these 79,194 characters are plain text which don’t need special handling! Let’s optimize this. // NEW: Attempt to match multiple non-special characters at once. // the current position until it hits a special character. This single change resulted in 48,118 fewer calls to that Cursor::getCharacter() method and an 11% overall performance boost! This is certainly helpful, but we can optimize inline parsing even further.